R.W. was born to be a cowboy. Although he grew up in a Texas town, he has lived and worked on ranches all over the American West. His start came with a summer wrangling job at Philmont Scout Ranch in the mountains of Cimarron, New Mexico. The work felt good. Whether driving cows, shoeing horses, singing around the campfire, or leading horse rides in the high country, R.W. knew it was the life he was destined for. He worked at Philmont for three years and then took a riding job at the Red River Ranch near Springer, New Mexico the summer after high school. His parents were anxious for him to get a college education, which he tried, but soon found he was more interested in riding a horse and playing his guitar than attending class. Consequently, he left school, loaded his saddle and headed for the Spade Ranch in New Mexico. Like a lot of young cowboys, R.W. got the urge to see new ranges after a few years. From the Spade Ranch he went to the IL Ranch of northern Nevada and then back to New Mexico and Texas to the 4T and K Cross Ranches, the Quien Sabe and the LS Ranches, where he started colts along with taking his place among the cowboy crew. Although he relished life on the Canadian River ranches, he still had the urge to drift which sent him to the ZX Ranch of the Oregon desert and then to the Pickerel Land and Cattle Company of Wyoming. All the while R.W. played guitar and sang cowboy and western songs, an interest he had pursued since high school. On the ranches where he worked he wrote songs based on his experiences. Most of the time he played and sang to entertain in bunkhouses and at roundup wagons; but periodically he was invited to sing in public. As time drew on, R.W. received more invitations, many of which paid considerably more than cowboy wages. As a result, R.W. came to a point where he had to make a decision. The demands of performing while holding a ranch job were much too difficult. In 1988 he decided to see if he could make a living playing music. The decision was monumental because he went from a ranch job, earning $800 a month with a house and beef, to an uncertain attempt to make a living in a new career. Invitations came sporadically at first, but eventually grew to include performances at rodeos, cowboy poetry gatherings, performing arts centers, churches, corporate events, and private functions. In 1985 R.W. added to his resume when he worked in Kenny Rogers’ movie Wild Horses. The role was a treat for him as it gave him opportunity to sing and play his guitar in the film and to work with Ben Johnson, Richard Farnsworth, and Buck Taylor. He has appeared in ten movies since, including The Tracker with Kris Kristofferson and two other Kenny Rogers films, The Gambler III and a documentary of the American cowboy. His peers in the Western entertainment industry have honored his performing and songwriting numerous times. In 1996, R.W. received the Academy of Western Artists’ first Will Rogers Awards honoring him with both Male Vocalist of the Year and Entertainer of the Year. A year later, his album, Ridin’ The Dreamland Range, won recognition as the group’s Album of the Year. The Academy named R.W. its Male Vocalist of the Year again in 1999 and 2002. Most recently, the membership of the Western Music Association voted him Top Male Performer for 2004. One of R.W.’s most creative efforts is the one-man stage play, The Last Cowboy, he wrote with his brother, Jeff, and playwright Dave Marquis in 1993. Set in the year 2025, R.W. plays an aging cowboy who recounts the history of the American cowboy through monologue and song. The show has received high praise not only for R.W.’s performance, but for his insightful interpretation of the cowboy past as well. 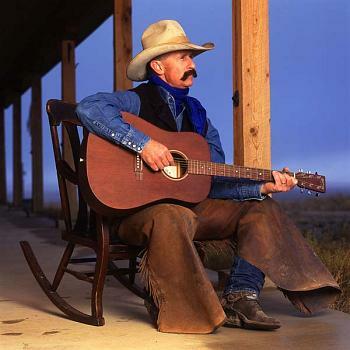 In addition, his album, The Last Cowboy – His Journey, which was inspired by the play, received a Wrangler Award in 2000 from the National Cowboy Museum and Western Heritage Center for Excellence in Dramatic Presentation and Original Music Composition. Today R.W. lives with his wife and their family on their Clearview Ranch at the foot of the Sangre de Cristo Mountains south of Cimarron, New Mexico. He has ten albums to his credit over the past 20 years. In between headlining at cowboy poetry gatherings and western music events across the nation, R.W. spends most of his time at the ranch doing the work he loves. His life is guided by his faith, his love for his family, and his desire to share cowboy life with his audiences.